Ant-Man and the Wasp is a 2018 American superhero film based on the Marvel Comics characters Scott Lang / Ant-Man and Hope van Dyne Wasp. 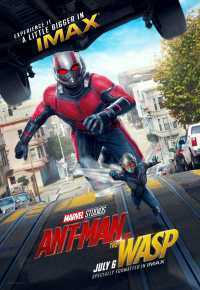 Produced by Marvel Studios and distributed by Walt Disney Studios Motion Pictures, it is the sequel to 2015’s Ant-Man, and the twentieth film in the Marvel Cinematic Universe (MCU). The film is directed by Peyton Reed, written by Chris McKenna and Erik Sommers, as well as Paul Rudd, Andrew Barrer, and Gabriel Ferrari. It stars Rudd as Lang and Evangeline Lilly as Van Dyne, alongside Michael Peña, Walton Goggins, Bobby Cannavale, Judy Greer, Tip “T.I.” Harris, David Dastmalchian, Hannah John-Kamen, Abby Ryder Fortson, Randall Park, Michelle Pfeiffer, Laurence Fishburne, and Michael Douglas. In Ant-Man and the Wasp, the titular pair work with Hank Pym to retrieve Janet van Dyne from the quantum realm. awesome movie…Please share this type of movies again….